Remember in my last post I asked how to "make that AcroRd32.exe go away when I am no longer using it in a browser?" Well, nobody came forward so I figured it out for myself. 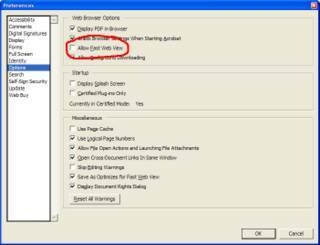 Open Acrobat, go to Edit then Preferences. 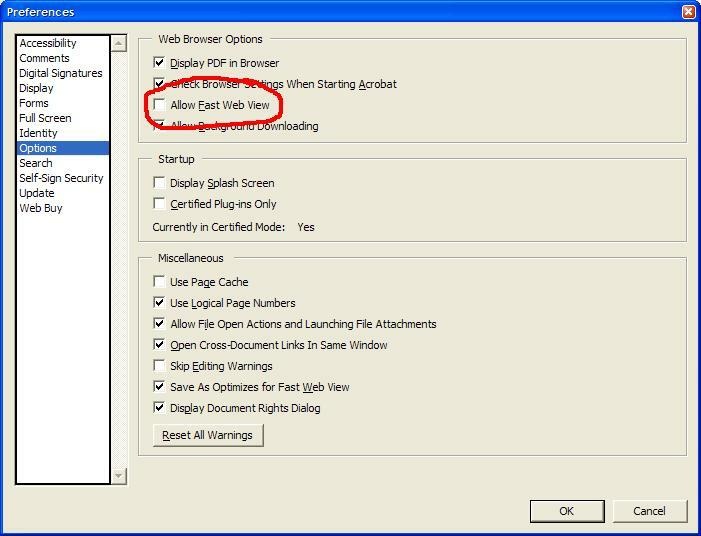 Uncheck the box "Allow Fast Web View" and click Ok. The beta version is about a 6.4 meg download, and can be downloaded as a file in order to copy and install it onto other machines. That's very nice, and a departure from Microsoft's often heavy-handed approach. The installation seems to default to a reasonably protected mode: the defaults are for auto updating, real-time protection, and scheduled scans (although the schedule is for 2 am). When you start up the program, it is initially set for a quick scan. I changed that to a full scan, which took about half an hour on my machine. From a quick test, the MS antispyware, at least in beta, falls between Spybot S&D and Adaware in terms of detection. Spybot is fairly conservative, and only deals with stuff that is pretty certain to be spy/adware, whereas Adaware will detect a bunch of other stuff. 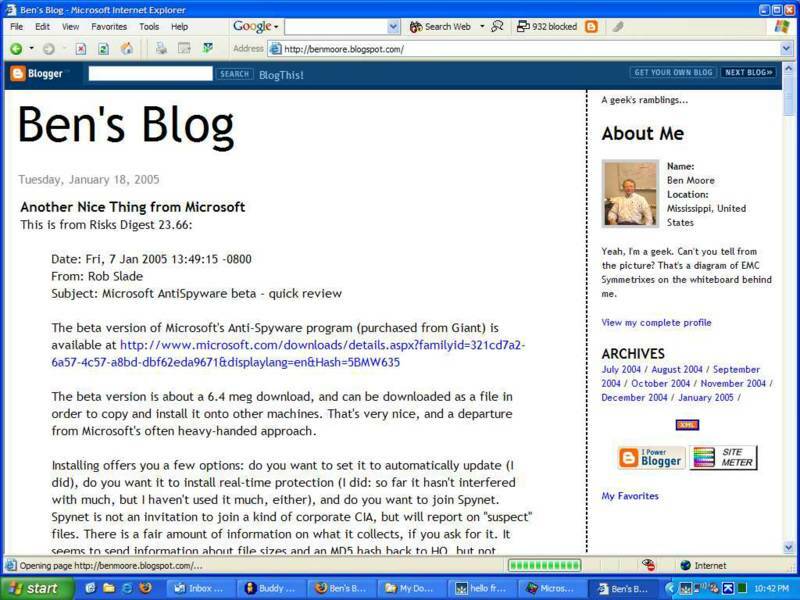 The MS product detected one copy of BackWeb (inactive) that Spybot had not, and detected about 38 copies of 15 versions of other stuff from my samples directory. (Adaware quarantined about 60.) The items detected all seem to have a least some remote access component, even if it is rather limited (such as BadTrans.B, that drops a keylogger). Oddly, it only detected two of my extensive collection of Bagles. You can ask the program to deal with individual threats in different ways, although seemingly not individual files. (As a researcher, I like that. In terms of protection, I'm not as sure.) The options are to remove, quarantine, ignore, or always ignore. 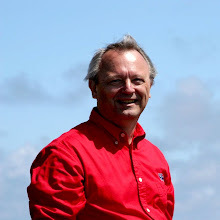 The program usually defaults to quarantine, although some threats are considered more serious, and marked to remove. The explanation of "always ignore" is not detailed enough, as far as I am concerned: does this mean always ignore this particular file, or always ignore this threat? 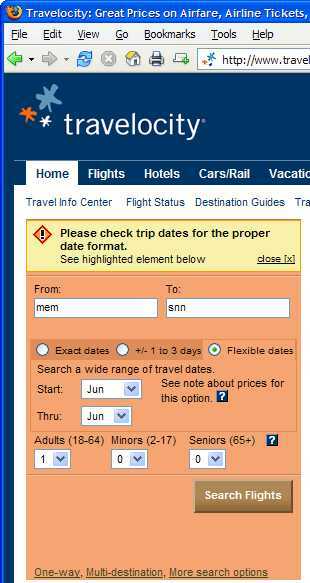 You can also specify certain directories to scan, or to ignore. Again, as a researcher I really appreciate the ability to tell it so ignore my sample directory. Unfortunately, this option doesn't work properly: it scans directories you tell it to ignore, regardless. When I told it to scan *only* my sample directory, it seemed to scan a fair amount of other stuff as well. Again, from a protective standpoint, this is probably a good thing. At the moment, after a very quick test, I'd provisionally recommend the use of the MS/Giant antispyware program, at least in fairly restricted and manual mode. I'd be interested in hearing from others who have tested the real-time operations more extensively, and particularly from anyone who has tested the Spynet capabilities, and what information is returned thereby. 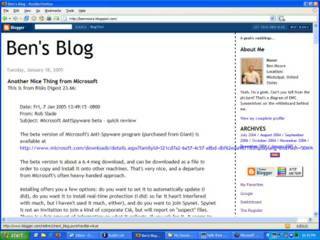 ...checks Windows XP, Windows 2000, and Windows Server 2003 computers for and helps remove infections by specific, prevalent malicious software—including Blaster, Sasser, and Mydoom. When the detection and removal process is complete, the tool displays a report describing the outcome, including which, if any, malicious software was detected and removed. 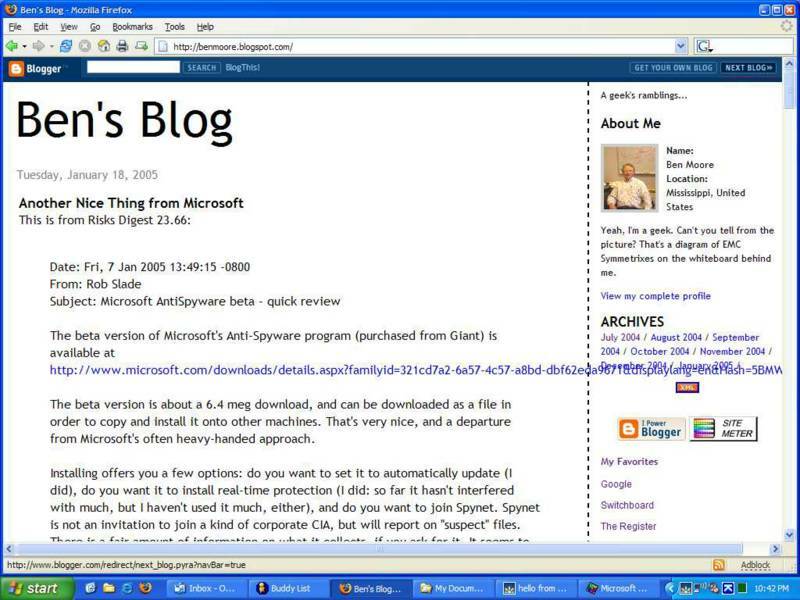 Notice they didn't mention Windows 98 or ME. They said that this program will be updated on the second Tuesday of each month in the regular patch cycle. 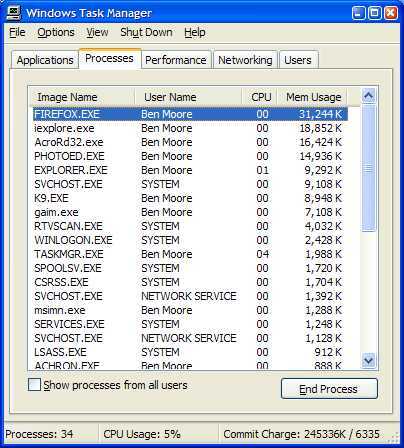 If you're running Internet Explorer (why would you be doing that? ), you can even run the tool online on this same page. There's a lot more information on this page. My parents' old cabinet TV finally gave up the ghost. For Christmas, they picked out a new entertainment center and I bought them a 27" Toshiba nearly flat screen and a DVD/VCR combo. I wanted the VCR since they still have a lot of old video tapes that they watch every now and then. I thought the DVD player would give them more options. What I didn't figure was the complexity of the DVD player's remote control. They need the DVD player to work just like the VCR. Tune the TV to channel 3, pop in the media (a DVD in this case), and sit back in the recliner. No buttons, no remote. What I came up with was to rip the DVDs to where all that was on them was the movie and no menu. This was much easier than I thought. 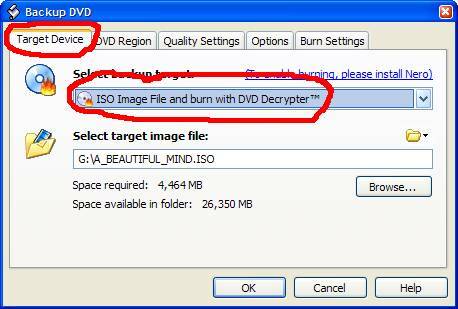 I use DVDShrink and DVD Decrypter. 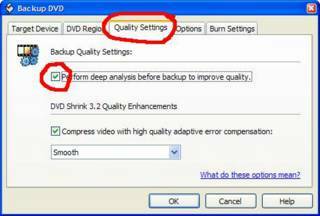 DVDShrink lets you "reauthor" the DVD selecting just the files you want. By default, no files are chosen so I choose just the main title and the English sound tracks. 8 times out of 10, this results in no reencoding. Here're some screen captures. First, open the disk in DVDShrink. You'll see that it starts in "Full Disk" mode. The compression required to fit this DVD on a 4.7 GB disk is 47.8%. 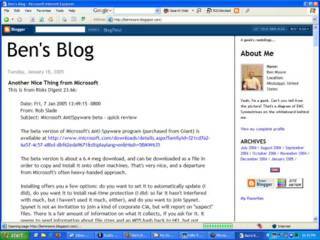 As I mentioned, I wanted to re-author this DVD to remove all the menus so click on "Re-Author." Drag the "Main Title" over to the left panel and click on the "Compression Settings" tab. Now uncheck all the stuff you don't want on the right. Watch the compression go down! I always want as little compression as I can get so now click on the double arrows just left of the word "Video." This lets you crop the movie from the front and rear. You'll notice that the time has been reduced from 02:15:10 to 02:07:14 and the compression is down to 77.5%. You're almost done. Now click on "Backup!" 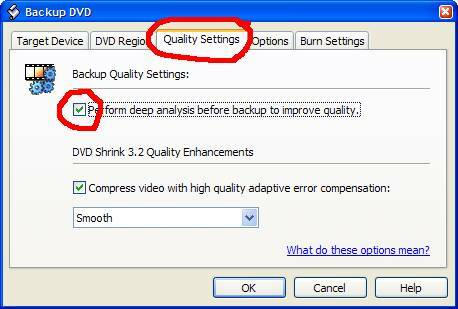 In this dialog box, click on "Quality Settings" and make sure that "Perform deep analysis..." is checked. This makes DVDShrink do a double pass and use Variable Bit Rates when it recompressess the movie. Wait! Click on the "Target Device" tab. 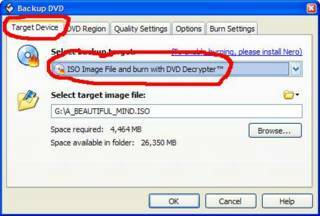 DVDShrink recognizes DVD Decrypter and automatically invokes it to burn the output DVD. I've got a DVD reader and a DVD burner so I put the source DVD in the reader and a blank in the burner. Click on "OK" and you're off. If there's no recompression required, my system (with a 2.4X DVD burner) takes about 20 minutes. If you have to recompress, your mileage may vary. I'm running DVDShrink v3.2.0.15 and DVD Decrypter v3.2.3.0. My processor is an AMD Athlon XP 2000+. My DVD burner is a Sony DRU-120A. 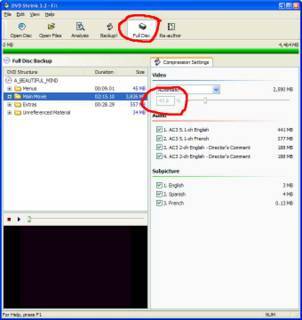 You can find DVDShrink and DVD Decrypter at VideoHelp.